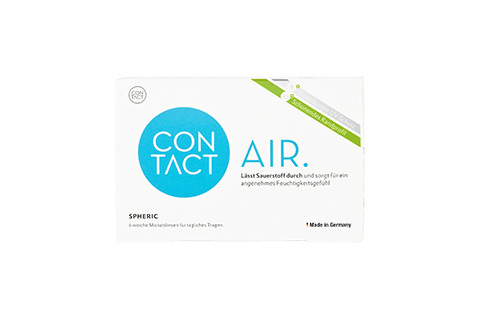 Contact Air Spheric lenses offer premium hydration levels for sensitive eyes which are prone to dryness. Modern technology, illness and dry natural environments can affect the moisture levels within the eye. Opting for a lens with advanced moisture can help prevent drying, scratchiness and redness. The Contact Air Spheric lens features a moisture content of 69% and is available in a 14.2 mm lens diameter. Manufactured in Germany to exacting international standards, it is the preferred choice for those who require a lens with a higher than average moisture content. Individuals with certain illnesses, such as thyroid disease or Sjogrens syndrome may find this lens a good option. Ordering online from Mister Spex ensures fast, traceable delivery from DHL, returnswithin 30 days and your contact lenses delivered straight to your door. Lenses can easily be renewed and replaced from your online optician.